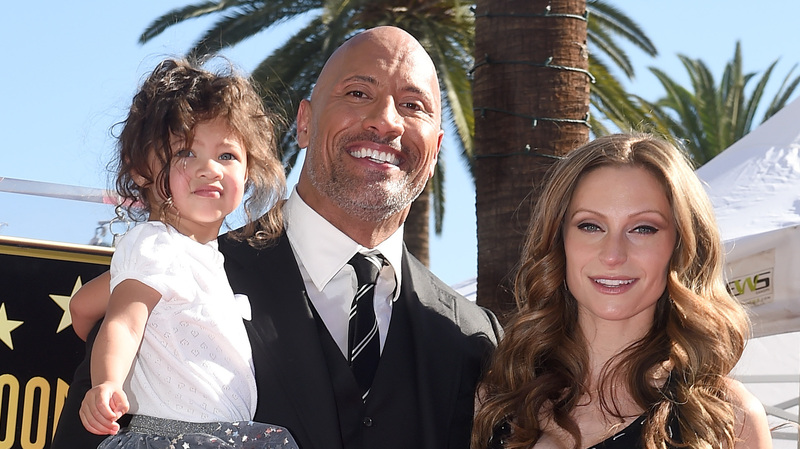 Dwayne Johnson may be known as The Rock, but he's a serious softie when it comes to his three daughters. On Saturday, he shared a photo on Instagram of himself and his middle daughter, Jasmine, 2, enjoying some pool time. Her take on her dad's dad bod is pretty much priceless. "Great to recharge the batteries this weekend, back home with all my girls and teaching this lil' tornado how to swim," Johnson wrote. "Took my shirt off and she said, 'Daddy I like it your brown boobies.. Thank you baby, but daddy has pecs, not boobies. #KickThoseLegs #UseThoseArms #MrBrownBoobs." "MrBrownBoobs" has to be the best hashtag we've seen in a while. Johnson's ability to make fun of himself endears him to his fans (and no doubt his family). He shared another photo a month ago with his 110 million followers in which he was hand-feeding his partner, Lauren Hashian, while she breastfed their newborn, Tiana. "I'll handle this business," he wrote with a winking emoji and a strong-arm emoji. Mama… has her hands full nursing/feeding Baby Tia, so I'm feedin' mama her dinner. My pleasure. So much respect to her and all mamas out there holding it down and running things." Yasssss. We'll take that attitude over big pecs any day of the week (although, hey, the combo is working well for Johnson). We especially loved his Instagram when baby Tia was born. "I'll love, protect, guide, and make ya laugh for the rest of my life. Your crazy dad has many responsibilities and wears many hats in this big ol' world, but being your dad will always be the one I'm most proud to wear," he wrote. Ah, Dwayne, you're slaying us, boobies and all. You can get your Dwayne Johnson fix in his new action flick, Skyscraper, in theaters now.